The phrase Do-It-Yourself (DIY), which generally meant building or repairing without any professional aid, has been re-defined to include �the auxiliary business service� concept. This is inspired from a prevalent concept in India of �getting product improvisations done locally by a service provider to your liking". This article explores the intriguing concept of DIY in the context of Indian firms. 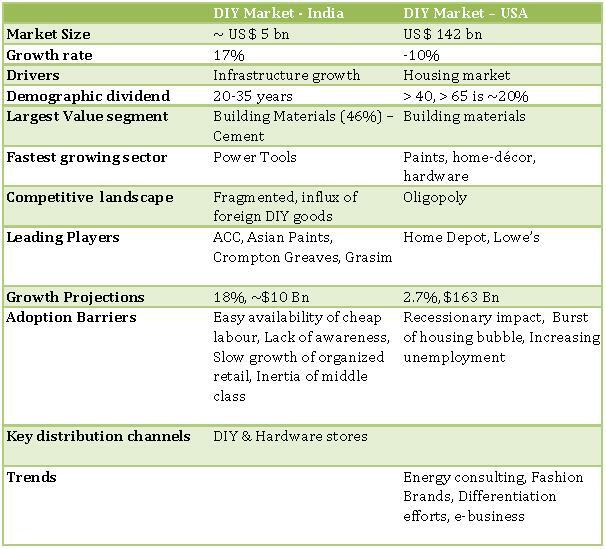 It begins with an overview of DIY in the USA/UK vs DIY in India and then explores the several consumer and producer motivations for adopting DIY. Finally, it explicates a framework to identify the potential DIY modes that are suited to Indian scenario. Earlier, the phrase Do-It-Yourself (DIY) basically referred to building or repairing something without the aid of professionals and the concept was limited to home improvement. However, over the years it has expanded to cover a wider range of skill sets and has expanded its market size. In 2009, the size of the DIY market in developed countries such as the UK and the USA is estimated to be �12.4 billion1 and US$142.7 billion2 respectively. The DIY process is best characterized by consumption which involves acquisition, assembly and transformation of goods for which American retailers such as Home Depot and Lowes specialize in selling tools. While DIY is an established phenomenon in the developed world, it is still in a nascent stage in India. However, India has a huge potential for DIY mainly due to its rapidly growing economy and surging demand for urban housing. Studies in the western countries have shown that there are certain characteristics associated with household pattern, economic and social conditions which drive a consumer towards exhibiting DIY behaviour. The younger households tend to be more active DIYers compared to those households which are in later stages of their life cycle. Households which had recently moved to a new place also exhibit similar characteristics. Families with a skilled manual trade background are more amenable to the DIY concept. Similarly, families with more number of adults and those who own the home take up DIY more seriously 3 . On the contrary, people with higher education and higher income levels are more likely to rely on outside help. Currently, the growth of the DIY segment in India is primarily driven by the increasing demand for urban housing and increasing disposable income of the households. Keeping this in mind, we can look at DIY in a broader spectrum that involves moving design, production and delivery as close to the end consumer as possible. To get an idea of the different forms of DIY, we first need to understand the prevalent buying behaviour in India. There are a multitude of consumer motives that drive Indians to or away from DIY. Generally, young residents of bigger cities are more likely to take up DIY in comparison to residents of smaller towns. This may be attributed to the prevalent culture and caste context and relatively conservative lifestyle in the smaller cities. Residents strictly observe social hierarchies and roles and hence upper and middle class families are generally unwilling to take up DIY activities as it is socially frowned upon. It refers to the stage where a user might actually feel the need to customize products according to his or her requirements. At this stage, the need to take up a DIY activity might arise in the consumer�s mind. The culture and the social stigma play an important role and at times prevent users from actually seeking any additional information in spite of it being a high involvement requirement. Understanding the consumer psyche at this juncture will enable companies to decide on the amount of information and the extent of education that needs to be provided to end consumers. Purchasing power and the economic scenario play an important role in determining the willingness or reluctance to take up any DIY activity. It is important for DIY companies to provide enough delight to customers in terms of fulfilling a task such that they perceive their effort to be as good, if not better, than the work of a skilled professional. The section explores different consumer and producer perspectives and tries and identifies the best form of DIY model that can be adopted successfully. We analyse Indian consumer�s expectations which might entice him to take up DIY. It refers to the effort that a user has to make to decide product or service features to make an impact on the choice of the final product quality. Companies such as Asian Paints and Berger provide users extensive options of colour choice and builds on this choice labour that users generally appreciate. The most important factor to take up labour is the ease and the cost of taking it up. Availability of cheap labour and low cost of making a mistake are factors which increases the willingness to take up DIY. Customers are also affected by the amount of customization that they are provided in a product. In India, companies such as Inkfruit and Pringoo have recently followed this route. They depend on users to generate designs for t-shirts and other accessories and outsource the manufacturing, printing and delivery to other firms with expertise in their respective domains. The involvement with the product to a very large extent influences the decision for going for DIY. It is observed that there are a number of household characteristics which affect the ultimate decision to take up DIY activities. Disposable income is one such factor. Families which have higher disposable incomes tend to hire professional labour for most of the physical work involved. We now look at producers� perspective and analyse how these perspectives affect their decision of providing consumers with DIY options. This is one objective common to all business; hence any form of modification in the delivery system which helps companies to improve their profitability will be an attractive proposition. 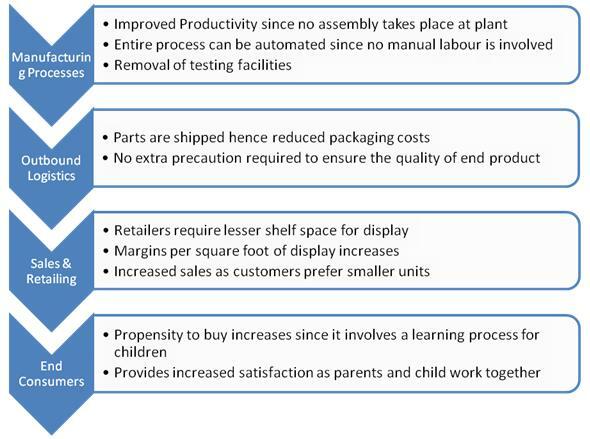 Migrating assembly and other parts of value chain towards the customer end is a viable option. For instance, in the bicycle industry, final assembly is done only after the order is placed and the user has an option of customizing the end product. Another important way in which manufacturers can benefit from DIY is by employing strategies that helps them look at new forms of delivery for existing products. MTR introducing the ready to cook range of products is a good example of how the ease of use is highlighted to introduce a new range of products. Certain companies which are looking at improving the satisfaction levels of their existing customers can turn to DIY options. Take for example the customization that Dell provides while placing laptop orders. Although the concept led to highly efficient supply chain operations, the primary aim initially was to provide knowledgeable customers an opportunity to create their own personalized laptops. This customer centric innovation led to other benefits like reduced costs, efficient logistics and increased sales. Firms can also employ DIY concepts in order to differentiate themselves in a crowded market. In the mid 90s, Titan Industries started displaying images of all its products in national newspapers. Most of Titan�s offerings were priced at a premium compared to the competitors and hence it was important for them to ensure customer buy-in. This strategy helped customers pre-decide their choice of models at the comfort of their homes along with opinions from all family members before actually buying the product at the shop. Pure DIY - When the cost of making a wrong choice is high and physical labour is not easily available, both the Choice and Physical labour is performed by the user. This is the pure form of DIY as seen in the US Paint and home improvement industry. Semi DIY - A second model of DIY, more suited to the Indian context, is the Semi-DIY approach which is appropriate for two distinct scenarios. Cost of making a wrong choice is high and availability of labour is high, thus the choice is DIY while the actual physical labour is contracted. The Indian Paint industry falls under this category. 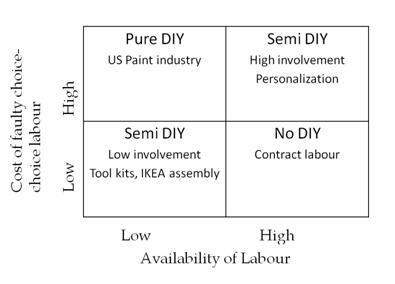 Cost of making a wrong choice is low, but labour availability is very low, thus the choice labour may or may not be DIY, but the Physical labour is necessarily DIY. Tool kits and DIY toys explicate this scenario. The following 4*4 (Exhibit 4) was developed based on the aforementioned Consumer and Producer perspectives and the Semi-DIY model, which is identified as the most practicable solution in the Indian context. This matrix explores the mode of DIY to be adopted at every intersection of producers� and consumers� needs. For example, a producer looking at improving profitability while catering to a customer segment with unique needs offers a Premium/Niche DIY Product solution. In majority of cases, a combination of needs can also be met � a producer wanting to improve profitability and be customer centric would offer a customized Premium DIY product to a set of target customers with unique needs. The cells highlighted in the table above denote those segments which have been tested in India in the recent past. The following are some of the success stories in this Semi-DIY model. Setup by Mukesh Bansal in 2006, Myntra is a pioneer in the personalized products and gifts industry in India. The concept has of late seen an upswing and is expected to become an INR 5,000 crore industry in India in the next few years. The need to indulge in such a DIY activity did not arise out of economic constraints; rather it stemmed from the need to individualize the end product. Started by Kashyap Dalal and Navneet Rai in the year 2007, Inkfruit is another DIY startup in the country. Unlike Myntra, Inkfruit is a destination for artists as well as consumers where the users have an opportunity to design and buy custom made t-shirts. This business hinges on the personalization and the pride factor that is associated with a consumer�s buying behaviour. Producers, on the other hand, reduce their costs of having to hire designers to churn out new creations for the end consumers. 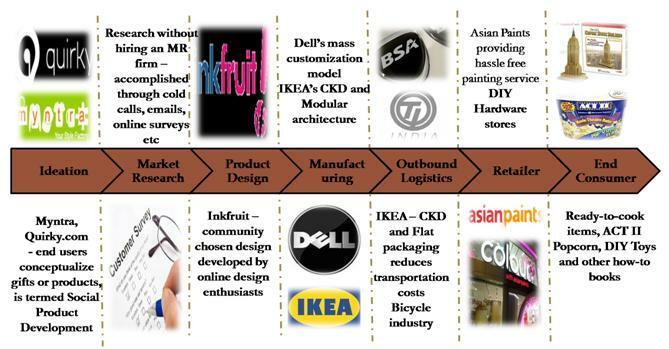 As shown above, DIY has been deployed at every stage in the value chain in the Indian market. 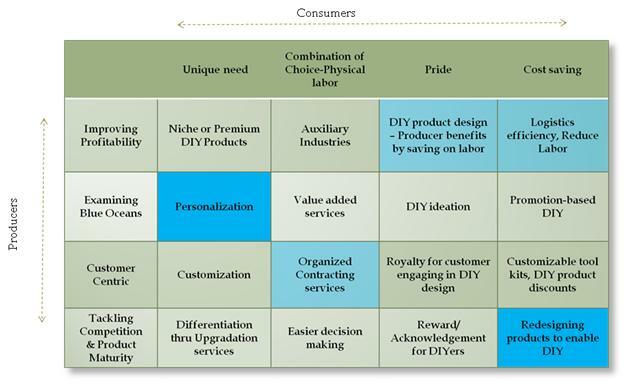 However, there is not a single player that has derived benefits from DIY usage at multiple points in the value chain. This presents a huge opportunity for a firm to develop a business proposition that benefits from DIY at multiple points. The DIY market in India is still at a nascent stage and there are a few distinguishing features which differentiate the Indian market from the western markets. The most critical consumer perspectives or expectations that influence DIY adoption are unique needs, labour � both choice and physical, cost savings and pride. Similar factors for producers have been found to be improving profitability, examining blue oceans, customer centricity and tackling competition in mature product stages. Based on these, a semi-DIY model where a DIYer takes up either choice or physical labour, and not necessarily both, has been proposed for the Indian scenario. Some of the potential DIY modes identified are differentiation through up-gradation services, DIY ideation, customizable toolkits and promotion based DIY. These findings would be of tremendous assistance to an entrepreneur aspiring to develop a DIY based business model. Ganesh N. Prabhu is a Professor in the Area of Corporate Strategy and Policy at the Indian Institute of Management Bangalore. He holds an FPM from IIM Ahmedabad. He can be reached at gprabhu@iimb.ernet.in. S. Archana (PGP 2009-11 at IIM Bangalore) holds a B.E from Vellore Institute of Technology, Vellore. She can be reached at archana.s09@iimb.ernet.in .